Chris began his career at Stenhousemuir and was then with Kilmarnock, St Mirren (loan) and Falkirk (loan). He joined United in August 2003 and was a regular in the line up for eighteen months but, out of favour, he left in January 2005 to join Gretna. Chris was born on this date in Broxburn. A fighting second half performance from United was not enough to stop Rangers from maintaining their one hundred per cent record in this season’s Scottish premierleague. A Capucho goal down at the interval, Ian McCall’s side attacked this afternoon’s visitors with conviction and, as the second half wore on, it looked increasingly a possibility that the Tangerines might level the match. A little piece of history was made today as United took on Inverness Caledonian Thistle on League business for the first time. United lined up in 4-4-2 formation. There were three changes to United’s starting line-up from the CIS win over Stranraer with Stuart Duff, James Grady and Andy McLaren all dropping to the bench. Jim McIntyre joined Jason Scotland in attack and Billy Dodds was handed a starting spot in the centre of midfield. The warmest welcome of the day was reserved for his central midfield partner, new signing Grant Brebner. 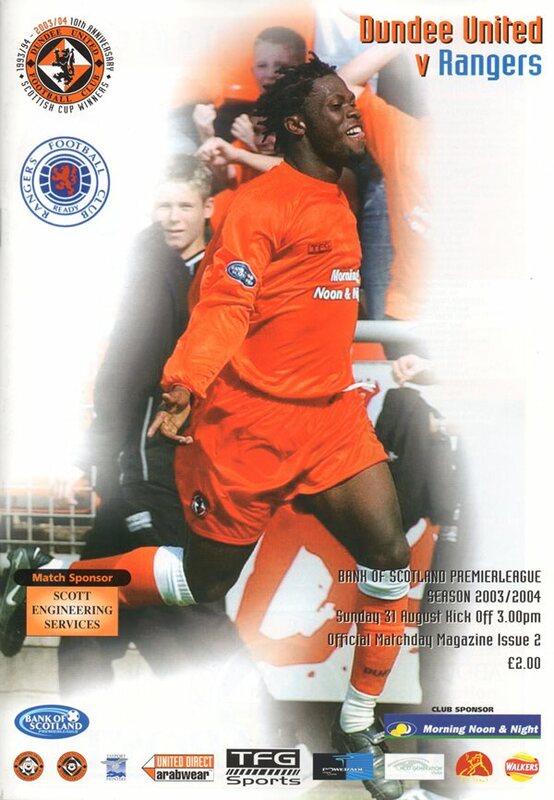 The former Hibs man would have required little introduction to most Arabs having made quite an impression at Tannadice on several previous occasions – not least when he scored a hat-trick to put United out the Scottish Cup in January 2003.
around the park but, to their credit, neither side seemed to let it dominate proceedings.